Your water time is valuable. Your cost remain static if you get skunked, or catch a box full. Fine tuning your knowledge base will pay massive rewards when you're over that future pile of fish dreams are made of. Tragic common mistake committed most often is trying catch what's not there. Just changing colors is not going to put fish under your boat. Adjust your speed & depths before thinking dramatic color shifts is going to save your day. Boat location is everything! Hopefully, the information presented in these articles will help the novice and expert alike ...FISH-ON! 1. 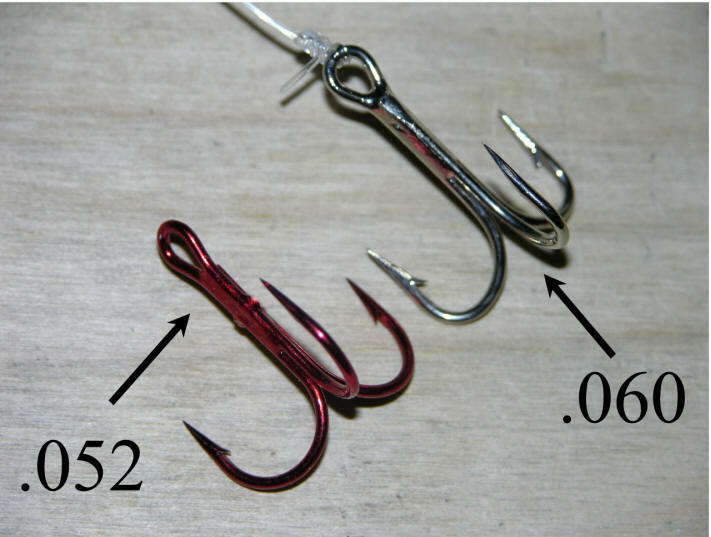 Hook, or bead drop refers to the distance from the fly to the hook . Too short and you'll miss hits. Too long & the same is true. We use five 8mm beads our production flies with single trebles. 2. Knot choice is up to you. Palomar and Trilene knots both chinch up quite nicely on stiff 50# leader material. Moisten, and push the knot down before the final pull test. This prevent the line from taking a heat set and looking curly and poorly made. I mentioned stiff leader material and the stiffer the better. That way fly movement is not absorbed by a soft flimsy cheap piece of line! 4. Setting the leader length depends on several factors. 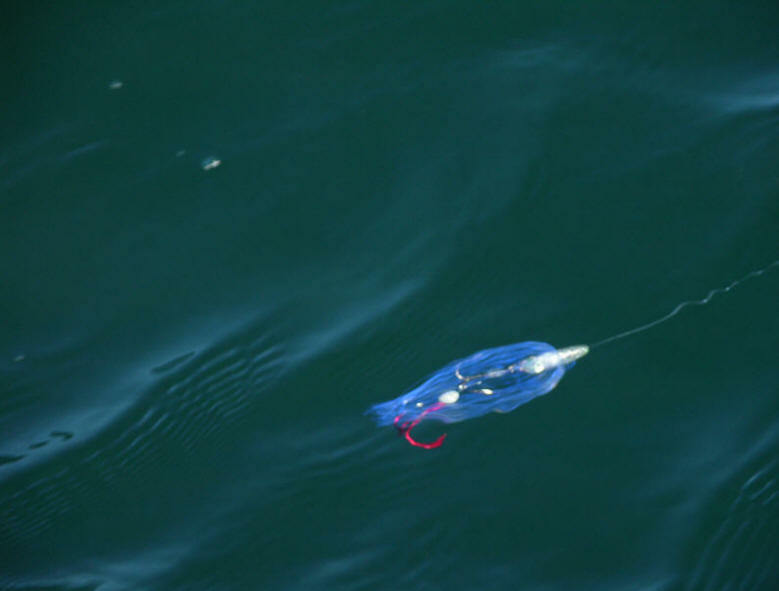 Speed, size of attractor, and the specie you're targeting is all part of this science. 5. General rule of thumb is 2 1/2 times the length of your attractor. I use shorter, more like twice the attractor length. Keeping in mind, I have precision speed control with my 15 hp. kicker. When needed: trolling bags to provide major whoa in following seas. Slower trolling speeds means less rigger blow-back. Plus, my fly maintains good movement, due to the slightly shorter leader. 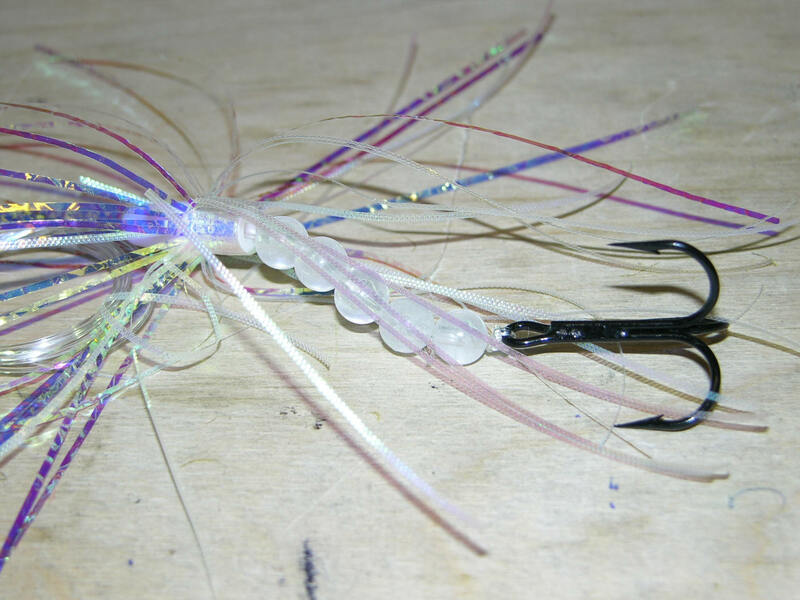 Don't get any ideas about attractors spooking fish. I've caught 100s of adult Coho Salmon with a 6" leader behind a size "0" dodger only 2' behind the cannonball back in the good old days! 6. Number 3 image is a new cracked ice Mylar with inherent light gathering UV properties. Coho will find a hard charging fly with a shorter leader more to their liking. Finicky later day Kings, or Lake Trout can prefer a more lazy subdued action. 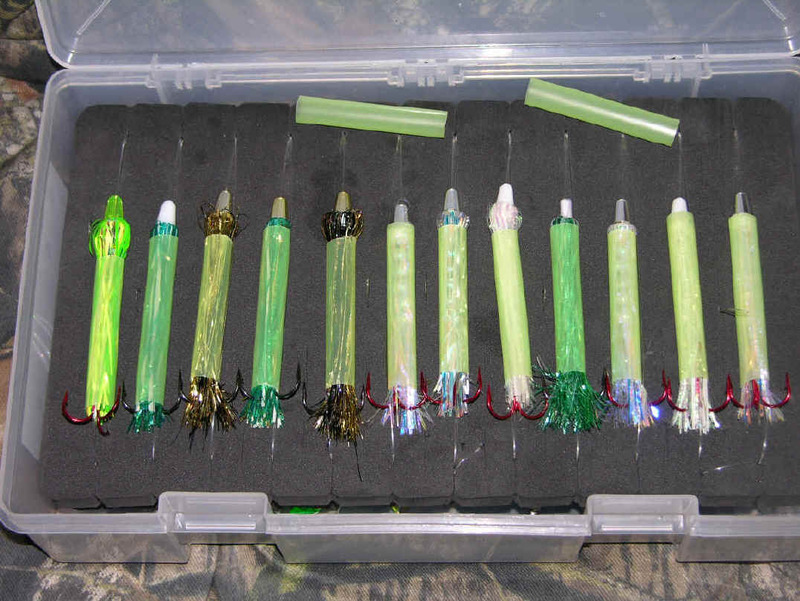 I seen my BTI flashers with leaders set at 16" to 25" put fish in the net. 16" on spring Coho. 20" to 25" for July-August Kings. Trial & error will formulate what works best for you, cuz speed is a critical issue affecting presentation. Fly leaders take a lot of abuse. Anything less than 40# test is just temping fate. Our Triple Fish Perlon 50# leader material will withstand abuse, but sooner ...or later all fly leaders will need replacing. After every fish inspect your leaders. Especially, the 6 inches closest to the hook. There's nothing written in stone. Longer, or shorter attractor leaders should be based on what works for you. Not any rule of thumb, or what's mentioned here in this article. Fluoro vs. mono is a question of price and that's why we offer choices at our webstore. 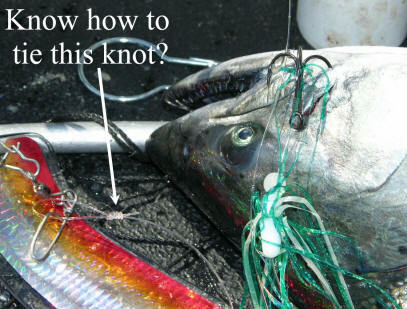 Fluoro 50 pound test is a little stiffer and makes it harder to tie knots. 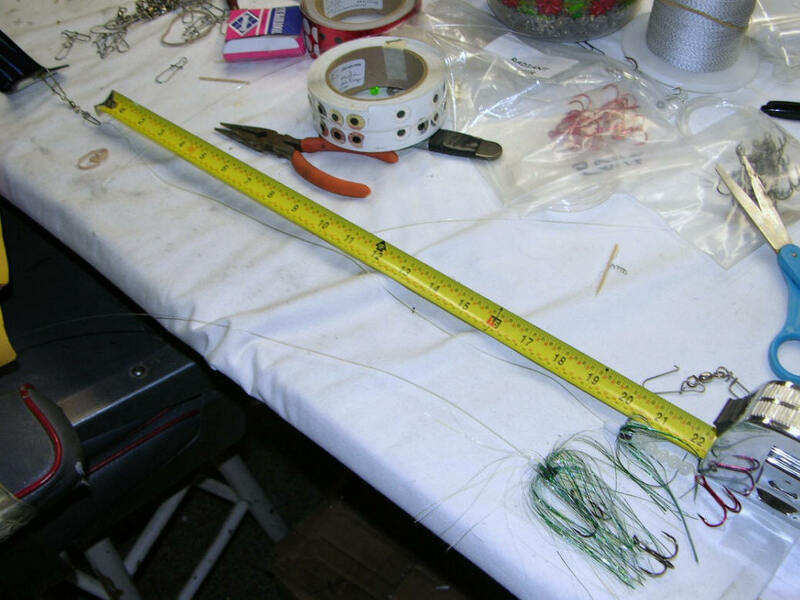 The double loop knot I use to attach the leader to the snap on my attractors is shown in great detail in my Encyclopedia of Tips and Tricks section. 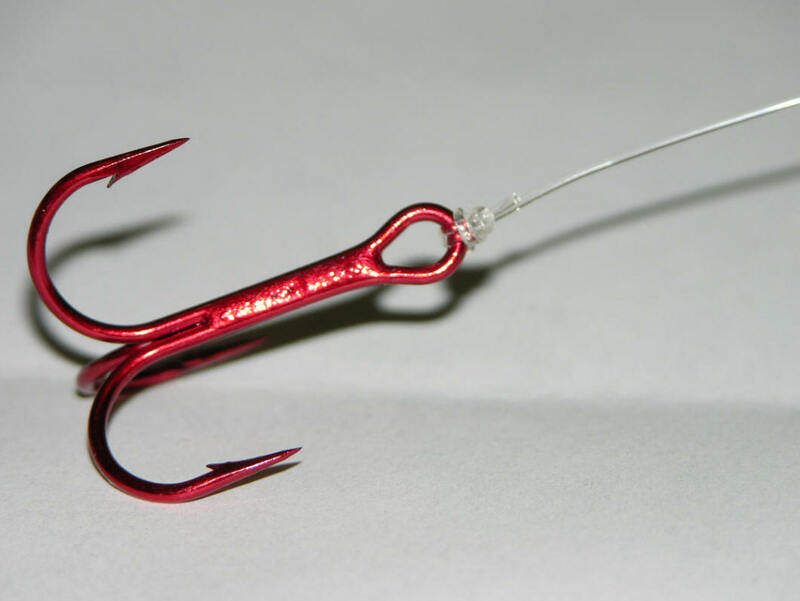 Along with several articles directly related to attractor fishing. 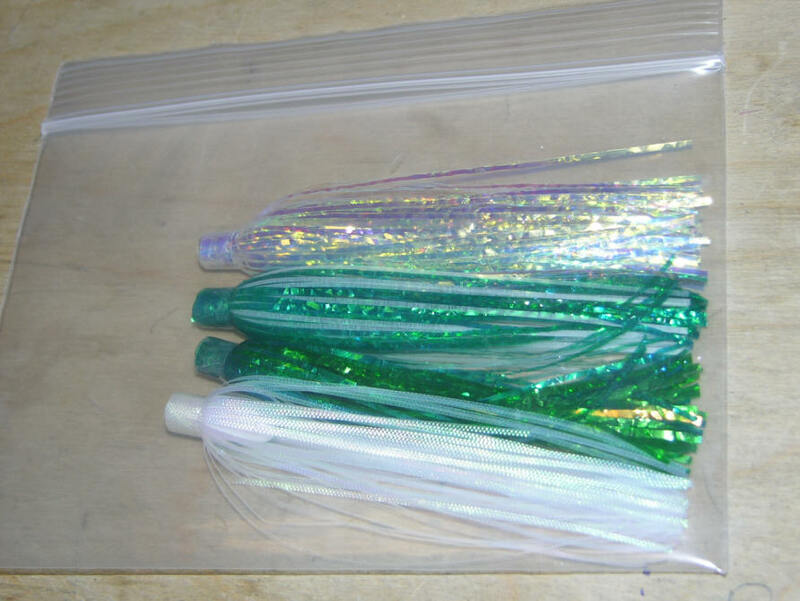 Until usage, store your newly reverse tied flies is a sandwich styled Zip Lock Bag. This eliminates tangles from the many stands 1/32" fringed Mylar material. You can have pre-tied leaders and beads for rigging aboard your vessel. 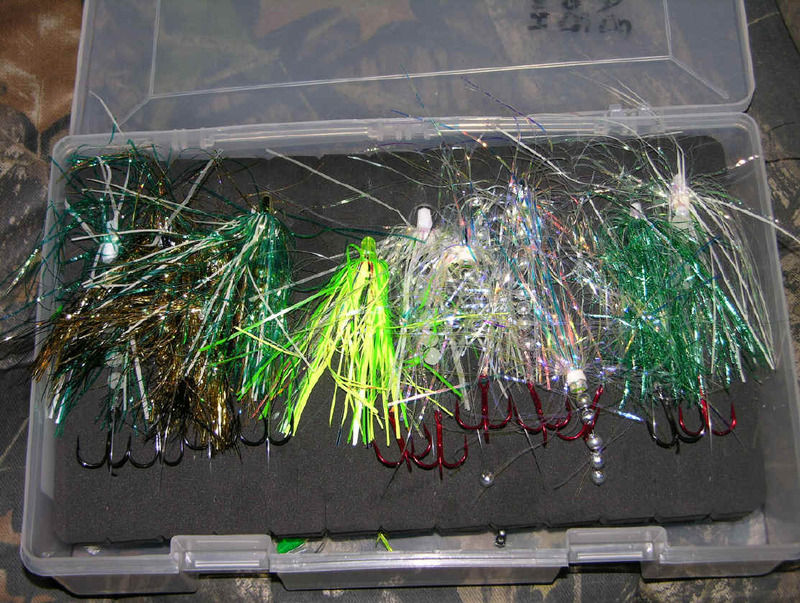 Trying to store your flies any other way is just not worth the grief trying to groom the strands to lay backwards. Water use will set the Mylar in a much more tolerate manner. With this system you'll soon appreciate the organization and the extended life of your flies. No Mylar fly will last forever. The fish chew them up and snarl the strands, or fringe together. Not to fear, the more chewed up they are? ...it seems the better they work!! Here's a strong point that needs to be made. 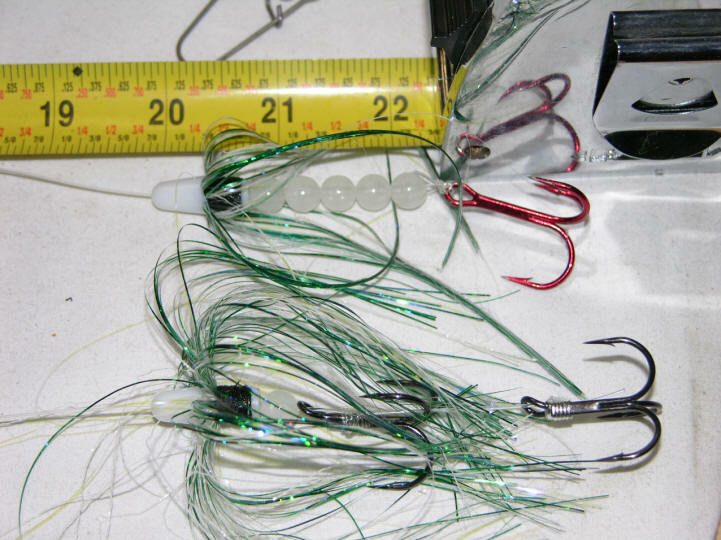 I've seen commercial trolling flies tied on stripped wire insulation and plastic tubing. Granted all these flies work. However, they do not provide the finished look, nor the color coordination a matching themed bullet head does. 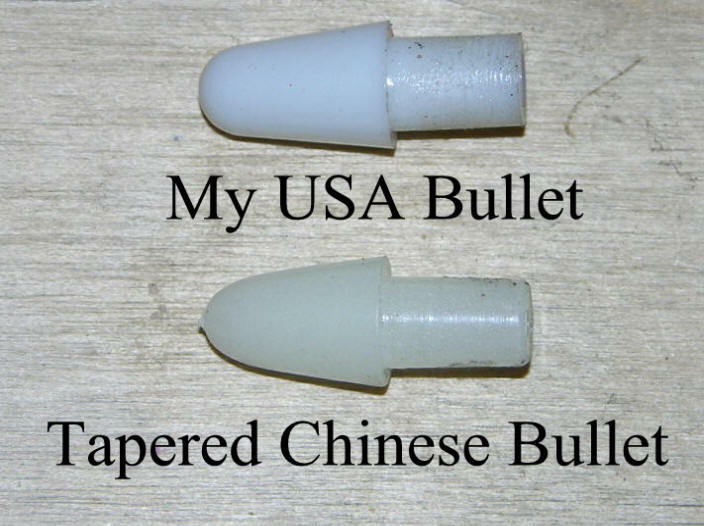 Even worse is the cheap skate Chinese bullets with a strong taper. Preventing full contact of the Mylar to the shank portion of the bullet. In simplest terms: it's like trying to wind material on a ice cream cone. 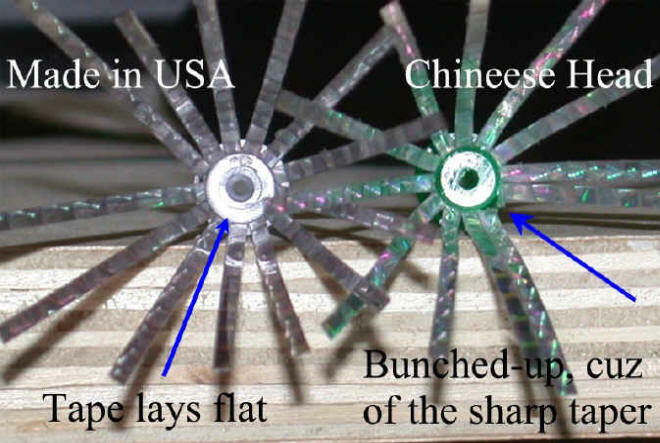 My USA heads have a .002 taper in 1/4" vs. my Chinese competitor's .020 taper. In order to have the bullet release from the injection mold, a slight angle is needed. .020 sounds like no big deal, but if you want the Mylar in full contact with the head ...it is! A strong taper just leads to lumps, voids, & uneven Mylar fly material. Often it's small things that make the biggest difference!